How great would it be for you to earn cash online? I’m talking about every single day. Does it sound appealing to you? I started this 6 years ago and I haven’t stopped yet. This is one of the most legit and easiest ways to earn cash online every single day. And it’s 100% free. I have been promoting Instagc for many years now, especially after earning my first $100. It literally took me 1 month. You may think that’s a long time and a small amount, but I had to learn the site. I had to test certain things in order to get more money. Now I am able to make between $8-$10 an hour using the site. The secret to making cash here? Determination. You can’t just say, I want to make money but then spend all your time looking for the highest paying task. If you are a regular reader of mine, then you have probably seen one of the many videos and blog posts I have made about Instagc. If not, I will add a video that I created a while back just going over the basics. It’s easy! You just complete small tasks and you get paid for doing them. These are all done online through your computer. One task may pay you $0.50 to sign up for their newsletter, and another task may be offering you $1.00 to answer 10 questions about your first car. These tasks range from just clicking on a website to proofreading an article. So many different ways to earn. You can even watch videos in the background and earn while you do other tasks! I’m telling you. This is the easiest way to earn extra cash online. If you are familiar with MTURK, then some of the tasks on Instagc will be familiar to you. For example, Crowdflower has a wall that you can earn from. This is my favorite and I earn more from this wall than any other. I would have to say the main Instagc wall comes in second on next highest paying wall. BTW, if you don’t know what a wall is, it is where you will find your tasks and pay amounts. How Much Can I Make In a Day? This is up to you. It depends on how much time you have. If you only have an hour, then it is super easy to make $7-$10. I try to make at least $10 a day. Some days I do slack though. I have found it is very easy to get off track trying to find high paying tasks, and then end up not making anything. You have to just do tasks, and not worry about how much they pay. They are typically done in 5 minutes and you will get paid. It adds up. Just try it. There are several ways to get paid. The #1 way I prefer is through Paypal. However, you will not be able to cash out to Paypal until you have cashed out at least $50, or reached that threshold. If you don’t feel like waiting until you reach $50 then you can get a gift card, deposit to your checking account or even request a check be sent to you. There are also 3 ways I personally am not familiar with, they are bitcoin, lite coin and ethereum payments. First thing you want to do is create your FREE ACCOUNT. After you create this account, be sure to check your email to confirm or else you won’t be able to make any money! 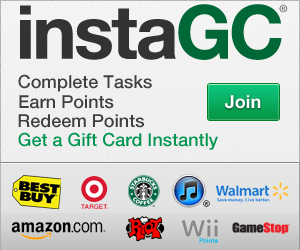 Once you have confirmed your email address, head over to the Instagc Facebook page and check for free codes. This is free money. Once you’re ready to start making money, use the tips I provided in the video above and start earning. You can always ask me for help too!